NYC Street Looks - BKRW Fashion from Alta Media Productions on Vimeo. Love this little video by BKRW fashion....the edit is great and I really captures that street feel. Also these shoes are insane!!! Make out of junk and rubbish - total one off Nikes....super super sweet....not sure how comfortable they would be though. 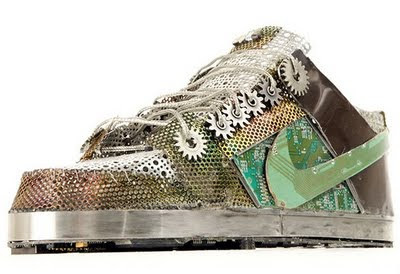 It does raise quite important questions about how we can recycle, it's clearly possible to make very cool shoes out of scraps as seen here. love the three screen video and the music goes so well...great upload...also I want those shoes!! I suppose if you have the will and the time, you can make something you'd be really proud of. I'm tempted to try something with some battered red and yellow dunks I have as whilst they're comfy, they're pretty much dead and make me feet wet.